Hi, I'm Josh Raymond and I am an illustrator currently living in Sydney, Australia. 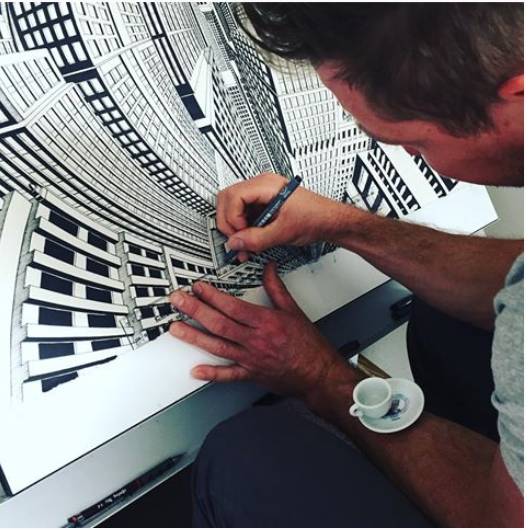 My artworks are large detailed illustrations of cities with unique perspectives that draw in the eye. Teetering between the possible and impossible, the cityscapes I create flow purely from my own imagination. My inspiration is drawn from a lifetime love and obsession with the cities of the world and the skyscrapers which occupy them. As a child I lived in the rainforest and cities were the furthest thing from my experience. Drawing cities, however, carried me to the far reaches of my imagination. An imagination which developed further still with each illustration. I have always loved art deco imagery and been fascinated with M.C. Escher and his explorations of perspective. Primarily, however, it is the architecture and the skyscrapers I have studied that have inspired my own interpretations. In the process of drawing I feel a growing sense of achievement with each minuscule detail, knowing that when I stand back to observe the overall work it will create the visual impact that only my invested time can achieve. I am driven by the end result and the sense of wonderment that my illustrations will bring to the viewer when they have been pieced together and worked to the final detail. Through drawing, I aim to create a world parallel to the one we live in, but with impossibilities that will stretch one’s imagination. My work is hand drawn in studio with an assortment of black ink pens and rulers on paper. 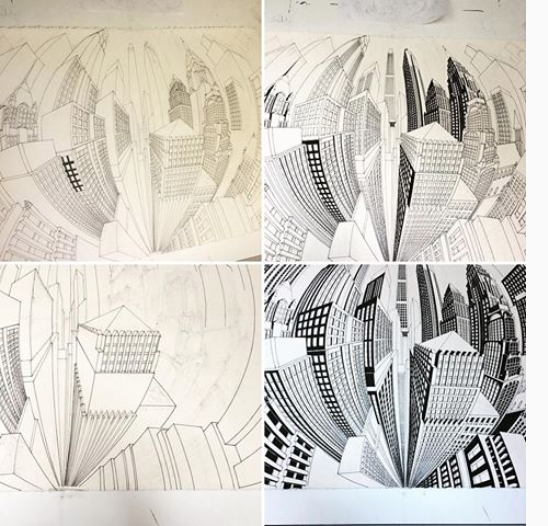 I begin by mapping out the perspective points and the overall city in pencil, gradually moving to ink pen for each individual building and finishing with the repetition of each meticulous element. I do not use colour in my illustrations as I prefer the focus to be on the perspective and the way light moves through the city, creating interesting shadows off the straight sharp lines. Each of my illustrations are completely original and unique concepts that strive to create unimaginable perspectives. 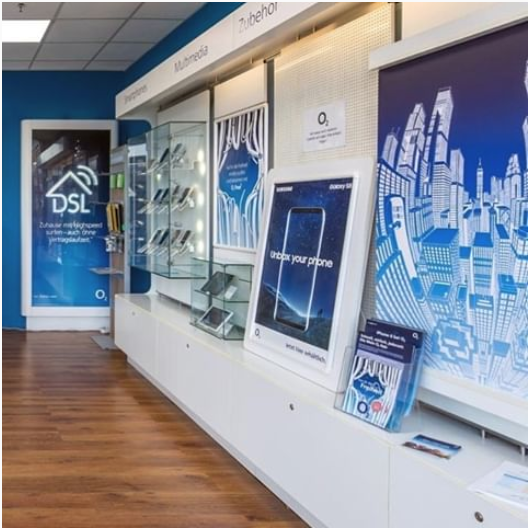 My work has previously featured in a pop up store for Tokyo Disney in Isetan, Tokyo, an o2 campaign in Germany and interior design for Soho Q3 in Shanghai. For any enquiries please contact josheyefull@gmail.com call +61 416 235 559.